Bill Barnes & Co Happy Hour :: TicketServices.gr " // + "
Your booking is valid provided you check in at least 30 minutes (19:00 & 21.00) before the performance starts. Please make sure that you arrive on time, otherwise your seats will be allocated to other visitors. Monica Bill Barnes converts GNO's Alternative Stage into an office party, and we are all invited to attend. American contemporary choreographer Monica Bill Barnes converts Summer Nostos FestivalΆs Alternative Stage into an office party, and we are all invited to attend. It is one of those uncomfortable office parties with bad fluorescent lighting which are destined to fail, but in a twist of fate something happens that makes it unforgettable. In Happy Hour, two female dancers play two utterly ubiquitous male characters, whom you usually meet in such a party. They seem like guys from movies, a famous comic duo, or your uncles who took it too far dancing at your wedding. But as female performers, they can never become these characters. In their persistent failure to become these icons, we can see something more special — two individuals desperate to wrest new meaning from our most familiar ideas of ourselves. 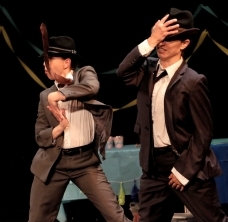 Happy Hour is one of the most successful contemporary dance productions of Monica Bill Barnes. The performance breaks every rule of theater and presents a new way to approach a character through movement.